Do you take sugar in your tea or coffee? Do you like your rice to be as white as possible? Do you use maida in your cooking and baking? Is your oil in your kitchen labelled refined? If you have said `yes' to the above questions, then you certainly need to read this article. Refined foods have become a part of everyone's daily food intake. Polished white rice, refined wheat flour (maida), sugar and oil are some of the refined foods which do not have alternatives, or so we think! Health experts are now beginning to stress upon natural, unrefined foods. If you need more nutrition, avoid refined foods, they say. 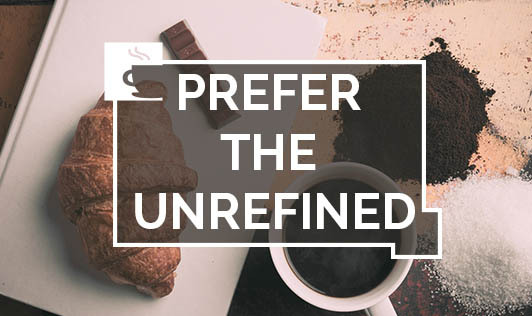 What makes unrefined foods better for health than refined foods? Fibre, among other things. Also called roughage and bulk, fibre is present in plant foods. Vegetables, fruits, whole grain cereals and pulses have plenty of fibre. Fibre offers considerable protection against constipation, diverticulosis, haemorrhoids and colon cancer. It also helps to stabilise blood sugar levels. Fibre in food brings about a satisfaction of appetite more readily than refined foods thereby easing the problem of weight control. Apart from fibre, unrefined foods also contain higher amounts of vitamins and minerals. Let's take the example of rice. Below the husk of the paddy. Is the bran layer which is rich in minerals, Vitamin B1 and cellulose. This vitamin is essential to digest the starch content of the rice gain. When rice is hand pounded, the bran layer is retained in the grain. But when rice is polished to make it look white, the precious bran layer is lost. Given alongside are the comparative values of hand-pounded and milled rice as published by the National Institute of Nutrition, Hyderabad. These comparisons make it clear what is better nutrition. A word of caution! White bread is sometimes coloured and sold as brown bread leading the buyer to think it is made from whole wheat. It is very easy to over eat refined foods because they do not give the feeling of fullness. When refined oils are made from nuts and oilseeds, they become highly concentrated in calories. For example, 10 gins of either coconut, groundnut or gingerly would give approximately 50 calories. But 10 gm of oil extracted from the same sources, gives 90 calories. Moreover, nuts and oilseeds do contain other nutrients. But refined oil is devoid of all other nutrients. When the intake of oil and sugar exceeds the recommended limit, there is trouble in the form of ill-health. Eating less of the refined and super-refined foods and more of natural, unrefined foods will take care of good health because you can get plenty of nourishment, naturally!